To challenge the world’s most scaring roller coasters, you must check the following top five rides from Cedar Point and Six Flags. Once named mantis, which was the first stand-up roller coaster, Rougarou was reconstructed and converted into a floorless roller coaster in 2014. The train climbs up to the 145 ft (44m) chain hill and then comes to a complete stop preparing for the most thrilling dive. When reaching at 60 miles per hour (97 km/h) top speed, your legs are just dangling inches from the track. Do you have the guts to do it? You won’t miss gatekeeper if you are addicted to roller coaster. Being addressed as the monster of roller coasters, Gatekeeper breaks seven world records. Its maximum velocity is 67 miles per hour (108 km/h) and makes riders experience 4 g-force. Challenge both your physical and mental limits. 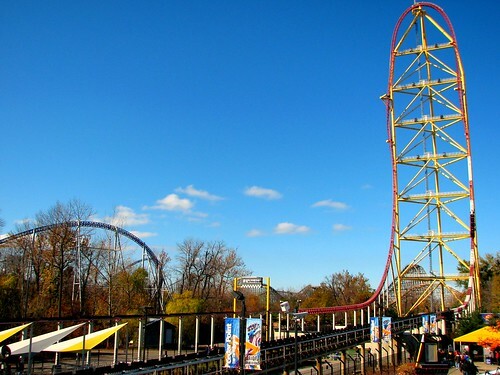 Headlined “race for the sky”, Top Thrill Dragster starts like a roaring racing car and accelerates from 0 to 120 MPH (190 km/h) in 3.8 seconds. After a 90- degree-counter-clockwise twist, it reaches 420-feet (130m) high, the second height only surpassed by Kingda Ka in Six Flags. Kingda Ka is the tallest and fastest roller coaster in North America. Its U-shaped track can lift you up to 456 ft (139m) high where you can barely think or feel scared but scream out with all your energy. It starts with a breathtaking accelerated speed, from 1-128 miles within only 3.5 seconds. Watch out this breath-taking thrill on YouTube. ​Goliath is the fastest, tallest, and steepest wooden roller coaster. It broke three records in wooden roller coaster family: the longest drop at 180 feet, the steepest drop at 85°, and the fastest speed at 72 miles per hour. It provides a thrilling feeling when wooden structure below your seat shaking strongly together. Checkout this thrill on YouTube. I went to Kingda once and that was a pretty cool experience for me and my family. I love the all these rides... Kingda is scary but once you are on it, you don't have a choice but to go through it.. In the end, you will say Wow! As someone who is scared of heights, I have to admit that it is definitely worth trying the Gatekeeper. Roller-coaster is my favorite! Just tried Kingda Ka. It's super fast but not so scared as it seems to be. I have tried all these rides, they all have their unique taste.. I enjoy all of them.. However, you will have to wait in long queue in NJ. But, that's worth, believe me. If you don't, go and experience it! Thank you for this article, now I know which roller-coaster I need to try next! I haven't tried these rides specifically, but would love to in next summer.. I heard they are open in winter, Is it true? I have yet to try any of the rides, but I've always heard good things about Kingda ka! These rides look scary! Have you being on any of these yet? Thank you So Much For Inviting Me To Read this Article Hiral.. Would Definitely Like to Try All the All the Rides When I will Come There..
Roller coaster are amaaazing adventure!!! It's really tuff to get on the roller coaster. There is always a conflict between mind and heart - yes no no no yes no and with YES finally, we try to get on the scream machine with a doubtful mind and some butterflies in stomach. It's real fun to get over our fear. Six Flags is amazing but I've never been to Cedar Point. I will definitely try those rides there, thanks for recommendation! I've visited Six Flags Magic Mountain many times growing up. I'm a thrill seeker and always look forward to riding the craziest rides with the highest drops and fast speeds. Who doesn't enjoy the adrenaline rush from riding roller coasters?? Good to know about these rides and locations for future visits! I haven't tried these rides specifically, but would love !!!! Thanx for sharing dis information abt rides and locations with me.... Amazing Article !!!! Wow! That's some research. Will definitely take my family there! I love rides and this looks amazing. People who fear of heights must be scared of these kinda rides ! Wow very informative article Hiral. Though I haven't been on any it gives me adrenaline rush. Will b tryin soon. Amazing post! It reminds me my experience at those thrilling games with my kids! I always encourage them to take a ride with me such as roller coaster, space mountain since I love those games so much! Good job! The scariest one I've been on is the Rip Ride Rockit in Universal Studio Florida.